BOOK NOW to Reserve Your Kauai Kayak Tour Today! Why tour with a guide? With Ali‘i Kayaks, your guide does the work. Our kayak tours take the hassle out of your day. Our guides will prepare all the equipment for you and help get you set-up for your tour. Guides have been there, done that. For individuals without paddling experience, our guides will provide you with paddling instruction and assist you with your launch. They’ll accompany you for the duration of your tour, providing assistance where needed. They know tricks and tips that will make your journey as easy as possible. They will even bring walking sticks for you. Safety. You can feel safe with all Ali‘i Kayaks’ guides who are Water Safety Instructed, as well as CPR and First Aid certified. They will lead you safely throughout the entire tour. Mana‘o. In Hawaiian the word mana‘o means knowledge. Also, all guides are “local boys” who are very knowledgeable about the flora and fauna in the area. 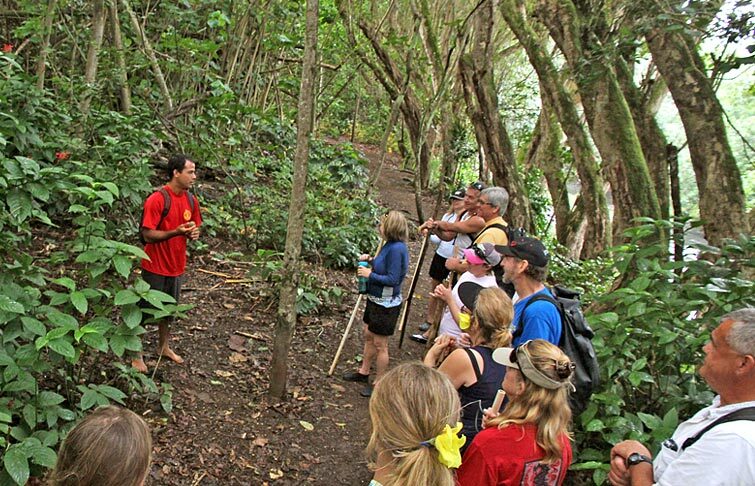 Your guide will take you back in time and tell you why Wailua is such a special and sacred area to the Hawaiian people. Enjoy this tour and experience the true “Aloha Spirit”. Some of our guides are experienced fisherman and you may get a chance to see them catch fresh water prawns, mullet, and tilapia.